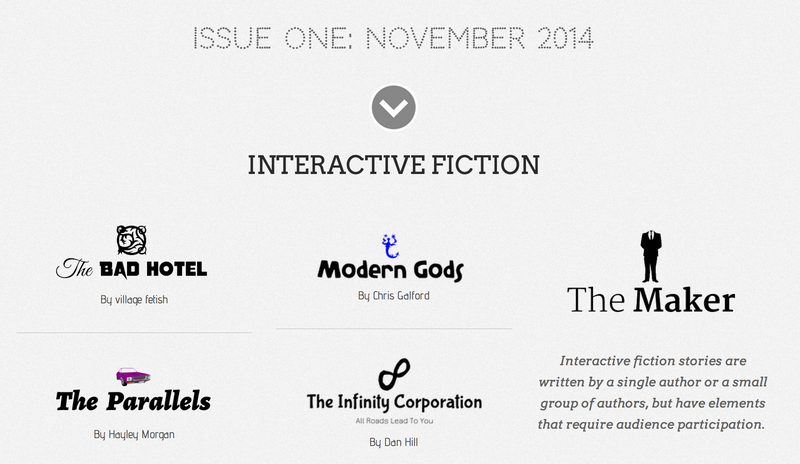 Fiction Crowd is a new website that describes itself as an “alternative, interactive literary zine”. It’s probably a misnomer to describe it as a zine for interactive fiction, though: the interactivity is mostly with the zine rather than with the fiction itself. I didn’t think I would have to pay extra for the faceless man that is always in the periphery of my vision. …but some of them don’t hit the mark so well, which I suppose is to be expected when you invite a bunch of people to come along and riff on your premise. “The Infinity Corporation” is a story that consists of three nominally unrelated documents from different viewpoints; it’s basically a straight epistolary short story. “Collective Dream Journal” is a page on which several different authors have contributed dream narratives. “Doomsdates” is a collection of flash fiction about really unpleasant dates. “The Parallels” does have a point-and-click interface for exploring part of the story; but this felt a bit clumsy to me, a rather rough picture linking objects to descriptions on another page. Many of the stories are illustrated or supported by mocked-up images of Twitter exchanges and text screens from phones — again, something of an epistolary instinct. These are by various authors, and some have a tighter style than others, but overall the type of prose featured here suggests an editorial taste that I don’t quite share. This overview feels like it’s come out largely negative, but there are some things about this website that do attract me. The cues for future writing feel a bit like a rolling version of the IF community’s themed minicomps (ShuffleComp, ECTOCOMP, the Apollo 18 Comp, the cover art comp, etc). The design itself is rather slick. Some of the work is that style of speculative fiction that uses a few brief references to suggest an alternate universe very different from our own. It’s Patreon funded, which I think is not always a great model for every type of endeavor (specifically, I worry that it encourages some creators to do shorter, less ambitious works than they really want to because Patreon rewards creators with a steady stream of frequent output), but Patreon makes a certain amount of sense for a regularly-released zine.